So just under four years since the Pierate Ship set sale, on the 19th October 2013 yet another impressive milestone was reached. The web's leading pie review blog celebrated 50,000 pageviews! Having reached 25,000 pageviews only back on 30th March 2013, it has been a meteoric rise since the addition of the @pierateers twitter account. People are loving these pie reviews! But there's a question we Pierateers get asked more than most (more so than what is our definition of a pie - which can be viewed in our pie dictionary). That question is this: "Who is your number one?" It is, of course, an answer that can quite easily be found by visiting our pie rankings page. But from 30th January 2013 until at least 18th November 2013, the answer is Paul's Pies! Now it doesn't take a degree in rocket science to work out who runs the show at Paul's Pies. The clue is in the name! But Paul Sykes will hopefully stick in many more minds now, as today he is inducted into the Pierateer Hall of Pie Fame as only our third Honourary Pierateer! Well done Paul and his entire team! Paul receiving his latest award! 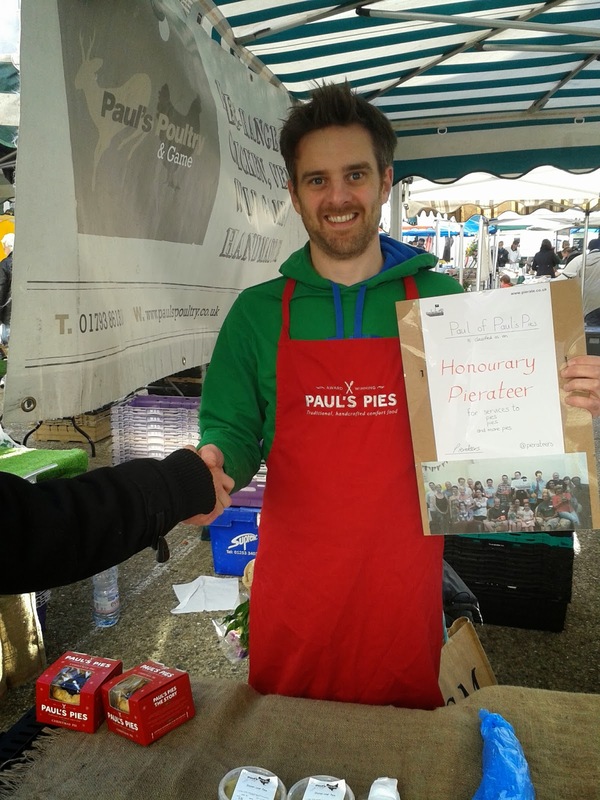 Have you tried one of Paul's amazing, award winning pies? When was the last time you bought a pie, took it home, put it in the oven with great anticipation of what's to come only to stick your fork in, the pie deflates and you find it was only half full? I haven't even started on the rubbishy pastry or the gravy, yet. That, in a nutshell, is pretty much why I started making my own pies. They only started in 2011 and are already winning prestigious food awards. More importantly though, to date they have been the most successful pie makers at meeting the strict Seven Cs criteria, as the number one pie on www.pierate.co.uk since 30th January 2013. On top of this he is a genuinely great bloke, has really embrased the Pierateers and we for one are delighted that he plans to put his Honourary Pierateer certificate up in the kitchen to ins-pie-re his team of pie makers! We hope to visit next year and see the certificate in its pride of place! However, nothing can top being ranked Number One on the Pierateers pie ratings blog. These intrepid pie explorers love pies so much they took it upon themselves to rate them all on their blog. Artisan or own-brand, they have made their way through an impressive selection of pies and it is a serious honour to be at the top of the list. They, after all, are people who genuinely love pies and know a good pie from an average one. With some really exciting developments in the pie-peline, it seems Paul's Pies are here to stay! And it will take a truely top pie to dislodge him from the top of our pie rankings! 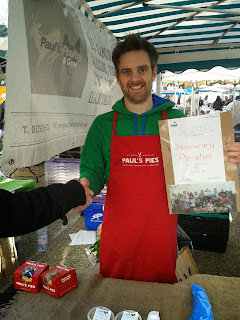 Note: We want to say a big thank you to Paul for agreeing to feature in our '12 Pies of Christmas' video. It was great fun meeting Paul again and we look forward to seeing him again soon. Click here to view all the Paul's Pies we have reviewed.